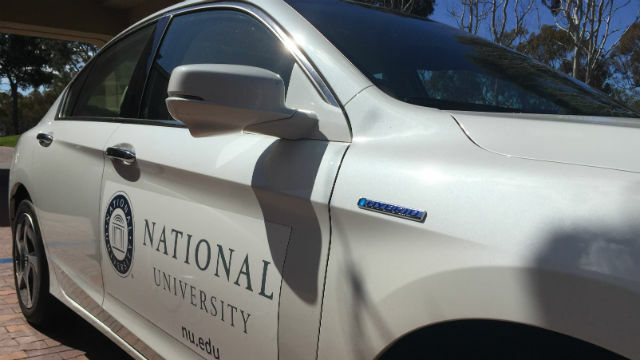 National University is demonstrating a commitment to fuel efficiency and the environment by replacing its current vehicle fleet with 26 Honda Accord plug-in hybrids. The San Diego-based institution, which is the second-largest private nonprofit university in the state, is thought to have the largest fleet of this Honda model in California. The hybrids will be used by employees who travel to the university’s more than two dozen campuses on a regular basis. “National University is proud to be a leader in contributing to cleaner energy alternatives that benefit our environment,” said Randy Frisch, vice chancellor of business and administration. The California Air Resources Board is encouraging the adoption of zero-emission vehicles, with a goal of 1.5 million on the roads statewide by 2025.